The gardens at the Brewster Inn here in Dexter Maine have started to get a good amount of attention not only via word of mouth from guests but also from people that are passing by and see the gardens. Now all of a sudden i get people coming asking if the gardens are public. They are not really public, they are for my guests to enjoy but if someone comes up taking an interest in them, i will always give them a quick tour and of course make sure they have a Brewster Inn business card and brochure to take away with them for next time. 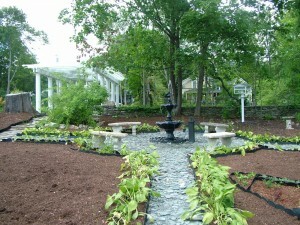 The Brewster Inn also had good press attention recently from both Birds and Blooms magazine and the Boston Herald. Its filled out a lot more now. That pic was taken during the planting in early June. Now its really established itself and filled out completely and when we get a sunny day again, i’ll be sure to post it hopefully for my next post. Not only does my butterfly garden attract butterflies but i also get quite a few hummingbirds visiting there too. The Brewster Inn gardens are really coming on now in year 3 of a 5 year plan and that’s all thanks to help from wonderful gardeners. Here is another angle of this section of garden taken from late June. All the slate is Monson slate from Monson Maine. Its the original slate off the roof from when the house was remodeled in 1934. Lots and lots of excellent landscaping materials complete with nail holes to landscape areas of garden and make new pathways.. beautiful! 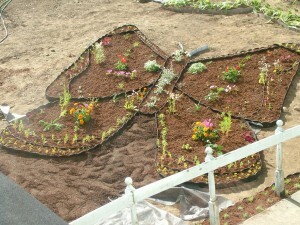 This entry was posted in Gardens and tagged Brewster Inn, Butterfly garden, Dexter, gardens, Maine by admin. Bookmark the permalink.